On the Tennessee Trail, the city most famous for dry-rub ribs, Memphis, racks up an all-star lineup of outstanding barbecue joints. Ribs are definitely on the menu, but there are more goodies in store in the Bluff City. Traditionally, the pulled pork sandwich has been the king of Memphis barbecue. Not only does pulled pork still thrive between the buns, but in Memphis it has found its way into all sorts of other dishes, from BBQ nachos to pulled pork stuffed baked potatoes to the uniquely Memphis specialty of BBQ spaghetti, essentially pulled pork and barbecue sauce on spaghetti. 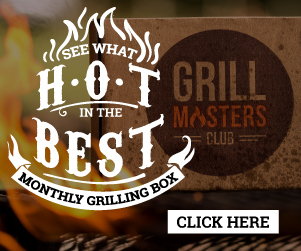 Pulled pork and ribs – wet or dry – occupy the top of the barbecue food chain here, but there are myriad other options too, from lamb riblets to whole smoked Cornish game hens to BBQ bologna and the smoked hamburger. Even beef brisket, that Texas specialty, makes an appearance, though this is a dish better left to the Lone Star State. And while Texans often go sauce-less, barbecue in Memphis is all about tomato based sauce, with many eateries offering a slate of choices, and even the dry rib places serve sauce on the side. 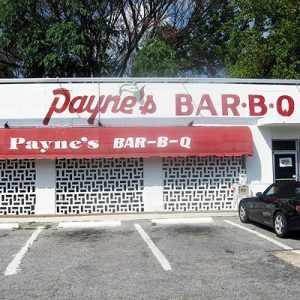 Interstate Barbecue, 2265 S. Third St., Memphis. 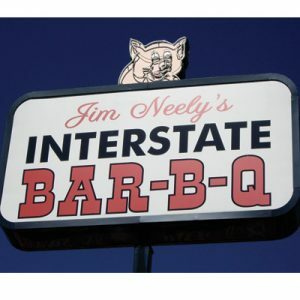 Interstate is Jim Neely’s restaurant, uncle of Pat Neely of Food Network fame. The ribs are great, but start out slowly with an order of barbecue spaghetti. Leonard’s Pit Barbecue, 5465 Fox Plaza Drive, Memphis. Now on its third location and second owner, Leonard’s has been around since 1922 and is said to be the originator of “the barbecue,” which in the Memphis vernacular is not a party or a grill, but a pulled pork sandwich with sauce and slaw. Get a barbecue and do not skip the slaw, which has a mustard base. Bozo’s Hot Pit Bar-B-Q, 342 U.S. Highway 70, Mason. Mason is known as the original home of Gus’s Fried Chicken, but it’s also home to one of the area’s oldest barbecue joints, Bozo’s. It’s not too far outside of Memphis, but it’s worth the stop for the pulled pork platter and a piece of pie. Helen’s Bar B Q, 1016 North Washington Ave., Brownsville. The thing to get at Helen’s is, once again, the pulled pork sandwich. But what’s special here is that the eponymous Helen Turner is not just the owner, but the pit master, cooking pork shoulders over real wood coals. Scott’s-Parker’s Bar-B-Que, 10880 Highway 412 West, Lexington. Scott’s is genuine rural West Tennessee whole-hog pit barbecue. There’s not a huge menu, but you may be able to specify what cut you’d like — if you’re lucky enough to get there when it’s not closed or sold out. Peg Leg Porker, 903 Gleaves St., Nashville. I’m no expert on Nashville’s barbecue joints, but those in the know suggest Peg Leg’s ribs. 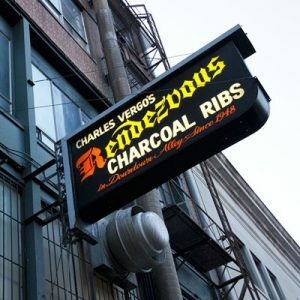 They’re made with a Memphis-style dry rub without the hassle of the tourist trap that is Rendezvous in Memphis. Martin’s Bar-B-Que, 3108 Belmont Blvd., Nashville. For simplicity, I’m listing the newest spinoff of Pat Martin’s famous Nolensville shop, known for “redneck tacos”: barbecue piled onto a cornbread hoe cake, topped with sauce and slaw. Smoke Et Al, Nashville. Finally, the trip ends with a visit to Smoke Et Al, wherever the food truck is located for the day. Smoke Et Al serves a variety of styles of barbecue, including pork, beef, chicken, and even vegetables. I can vouch for the smoked veggie tacos myself. And the fried pickled okra with ‘Bama white sauce is one of my favorite things to eat in all of Nashville.